The Feast of the Assumption of the Blessed Virgin Mary is on Wednesday, August 15. Sung Matins will be at 8:30 AM, Noonday Office at 12:00 PM, Sung Mass at 12:10 PM, and Solemn Mass at 6:00 PM. Mr. George Bozeman, Deerfield, New Hampshire, a noted concert player and organ builder, will play a recital at 5:30 PM. The parish choir will sing the Mass ordinary. There will be a special reception following the Solemn Mass in honor of the sisters and their ministries. We expect the sisters' last night at Saint Mary's will be Thursday, August 30. The Community of St. John Baptist was founded in England in 1852. In 1874, a house was established in New York City. Their first convent was at 233 East 17th Street. Their present convent in Mendham, New Jersey, was built in 1915. They would continue to have a presence in the city for many years. The last branch house at the Church of St. Luke in the Fields was closed in 1975. A chance conversation in Oxford, England, between then Father Allen Shin, now our bishop suffragan, and Father Lister Tonge, now dean of Newport, Wales, was the genesis of two sisters from St. John Baptist coming to St. Mary's to establish a branch house in the city again. Sr. Laura Katharine, C.S.J.B, and Sr. Deborah Francis, C.S.J.B., arrived on March 15, 2007. Sr. Monica Clare, C.S.J.B., took Sr. Deborah Francis' place on September 10, 2015. I am deeply thankful for the ministry they have had among us and others here in the heart of this city. I know many lives have been touched by their work, witness, friendship, and prayers. They faithfully participate in the daily worship of the parish. I will miss them greatly, especially in church, and I know they appreciate very much the liturgical life of our parish. 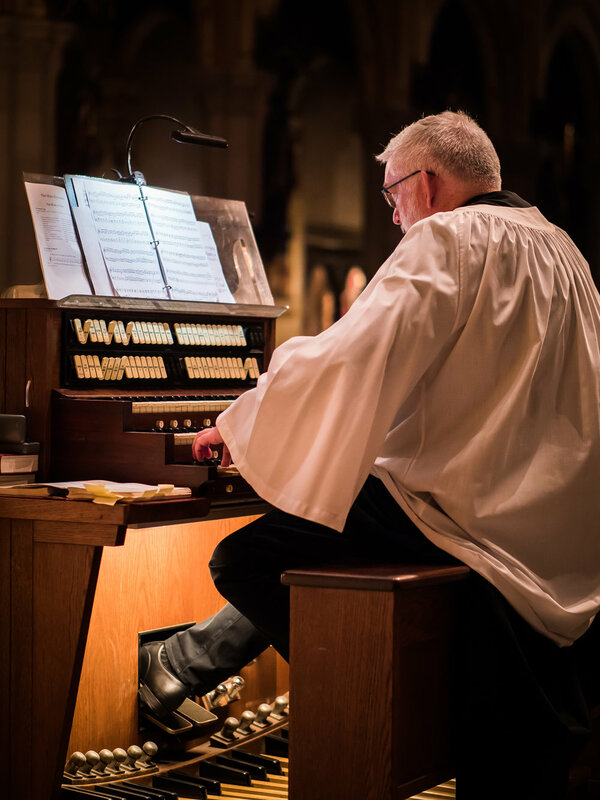 Parishioner Clark Anderson played for the Solemn Mass on August 5, while David Hurd attended the Organ Historical Society Conference in Rochester, New York. A little Assumption history. Father Donald Garfield became the seventh rector of the parish on February 1, 1965. On Sunday, May 2, 1965, he made the most fundamental change in the worship of the parish since its founding: for the first time Communion would be offered to the congregation at the Solemn Mass on Sunday. Before then, people who wanted to receive Communion here on Sunday needed to attend one of the Masses celebrated without music or sermon at 7:00 AM, 8:00 AM, and 10:00 AM. Receiving Communion without having eaten breakfast was an important Anglo-Catholic practice with deep roots in the Christian west. That said, one remembers that it was during supper that Jesus spoke words about the bread and wine. I think it's fair to say that for most western Christians it is still a challenge to think, for many reasons, that our spiritual food can be spiritual food because it is real food. In 1965, August 15 was a Sunday. As had been the tradition here, that year this Sunday was observed as the Feast of the Assumption. In addition, the collect appointed for the Sunday was also prayed at the beginning. Everything else was about Mary. In 1970, Prayer Book Studies 19: The Church Year was published. In preparation for the new Prayer Book, it was authorized for trial use by the 1970 General Convention. Father Garfield was a member of the Drafting Committee of the Standing Liturgical Commission for this calendar study. The parish began using the proposed calendar on Advent Sunday 1970-and it was on this Sunday that the practice we know of three lessons at Mass on Sundays and greater feasts, now normative in the wider church, began at Saint Mary's. In 1971, when August 15 again fell on a Sunday, the proposed calendar included the celebration of August 15 under the title "Saint Mary the Virgin, Mother of Our Lord Jesus Christ." It was celebrated here using this new title. In 1972, for the first time (as far as I know) a Solemn Mass was celebrated in the evening when the Assumption fell on a weekday. That has been the parish practice ever since. Father Jim Pace, celebrant and preacher. Dr. Hurd has selected Messe en Style Ancien by Jean Langlais (1907-1991) for the Mass ordinary for Assumption. The motet will be Hodie Maria Virgo by Luca Marenzio (1556-1599). I don't look ahead to the weather for what some years can be a very warm evening. But the worship is always great. There will be special refreshments for our reception. I hope many members and friends of the parish will be able to be here. YOUR PRAYERS ARE ASKED FOR Shauna, James, Karen, Timothy, Ilona, Robert, Alex, Sheila, Eloise, Angie, Maxine, Carlos, Susan, Marilouise, Dennis, Bob, Abe, Randy, Burt, Mike, Eugenia, Kyle, Greta, Karen, John, Melissa, May, Heidi, Takeem, Ridhima, and Sandy; for Horace, Gaylord, Louis, and Edgar, priests; for all the benefactors and friends of this parish; and for the repose of the soul of Lloyd Burroughs. GRANT THEM PEACE . . . August 12: 1897 Reginald Woodward Kirby; 1903 Antoinette LaValle Russell; 1904 Edward Fallon; 1914 Natalie Higman; 1962 Beatrice Mary Wheeler; 1987 Toyoko Anne Tsutsumi Morton. Heather Meyer (L) was cantor. As we go to press, $3,300 has been received towards the repair of the damaged plaster. $4,960 is needed. IN THIS TRANSITORY LIFE . . . Lloyd Burroughs, uncle of Blair Burroughs, died on Friday, August 3, 2018. Please keep Lloyd, Blair, and their family in your prayers. THIS WEEK AT SAINT MARY'S . . . Wednesday, August 15, The Feast of the Assumption of the Blessed Virgin Mary . . .Friday, August 17, 6:30 PM, Centering Prayer Group, Atrium, Parish Hall, Second Floor. AROUND THE PARISH . . . Pledge to keep up with your pledge! During the summer months we sometimes experience cash-flow problems as many friends and members of the parish are away, taking much-needed vacations. We are grateful to all those who continue to support the mission and witness of this parish . . . Father Jay Smith returns to the office on Tuesday, August 14 . . . Attendance: Last Sunday 143, Transfiguration 63. FROM THE MUSIC DIRECTOR . . . For Sunday, August 12: The cantor on Sunday morning is countertenor Jonathan May. Mr. May will be singing regularly in the choir of Saint Mary's in the coming season. During the administration of Communion, he will sing Fac ut portem from the Stabat Mater of Giovanni Battista Pergolesi (1710-1736). Pergolesi, Italian composer, violinist and organist, lived his short life within the late Italian baroque practice. His music, however, often foreshadowed what would later be recognized as classical elements. He is remembered especially as an early composer of comic opera (opera buffa). Ironically the Stabat Mater, a decidedly serious sacred work for which he is also remembered, occupied his attention in the final weeks of his life. He composed this setting for the Confraternita dei Cavelieri di San Luigi de Palazzo at a Franciscan monastery in Pozzuoli and was buried there very shortly thereafter. Pergolesi's setting is a large-scaled work in twelve separate movements, scored for soprano and alto soloists, strings and organ. The eighth movement, for alto voice and instruments, will be today's communion motet. Sunday's organ voluntaries continue a series, begun on 22 July, of the eight "Little" Preludes and Fugues, traditionally attributed to J. S. Bach. These pieces are now widely believed to have been composed by one of his pupils, very likely Johann Tobias Krebs (1690-1762), or his son Johann Ludwig Krebs (1713-1780). Of these eight preludes and fugues, four are in major keys of C, F, G, and B-flat, and the remaining four are in their relative minors of A, D, E, and G. The standard ordering of these eight pieces begins with BWV 553 in C Major and progresses up the scale to BWV 560 in B-flat. This morning's prelude will be BWV 556 in F Major, and the postlude will be BWV 554 in the relative minor key of D. BWV 556, for the prelude, is probably the least likely of the eight Preludes and Fugues to have been composed by Sebastian Bach. The prelude especially is stylistically much more suggestive of post-baroque classical composition. Its accompanying fugue has a similar harmonic and textural simplicity and continues in a bright spirit. BWV 554, numbered second in the collection and played for the postlude, has an A-B-A-shaped prelude, as did BWV 556. The fugue is modest in length and follows logically after the prelude. For Wednesday, August 15: Jean Langlais (1907-1991) was one of several notable twentieth-century organist-composers to have been strongly associated with prominent Paris churches. In Langlais' case, the church was the Basilica of Sainte-Clotilde where in 1945 he followed in the footsteps of César Franck (1822-1890) and Charles Tournemire (1870-1939) being named organiste titulaire, a title he retained until 1988. Langlais, who lost his sight to glaucoma at age two, began organ study with André Marchal (1894-1980), a prominent Paris organist and teacher who was also blind. He later was a prize-winning student at the Paris Conservatory where his studies included composition with Paul Dukas (1865-1935) and Marcel Dupré (1886-1971). Langlais also had a distinguished teaching career at the Schola Cantorum in Paris, where he taught from 1961 to 1976. In addition he toured widely in Europe and the United States as a concert organist and composed extensively for the organ. His choral and organ compositions frequently have chant references or other neo-medieval characteristics. Langlais' Messe en style ancien, Opus 75, dates from 1952 and was scored for mixed choir of four voices with or without organ. The Gloria of this setting declaims the text with great clarity; voice parts singing syllables in rhythmic unison throughout in chordal fashion. 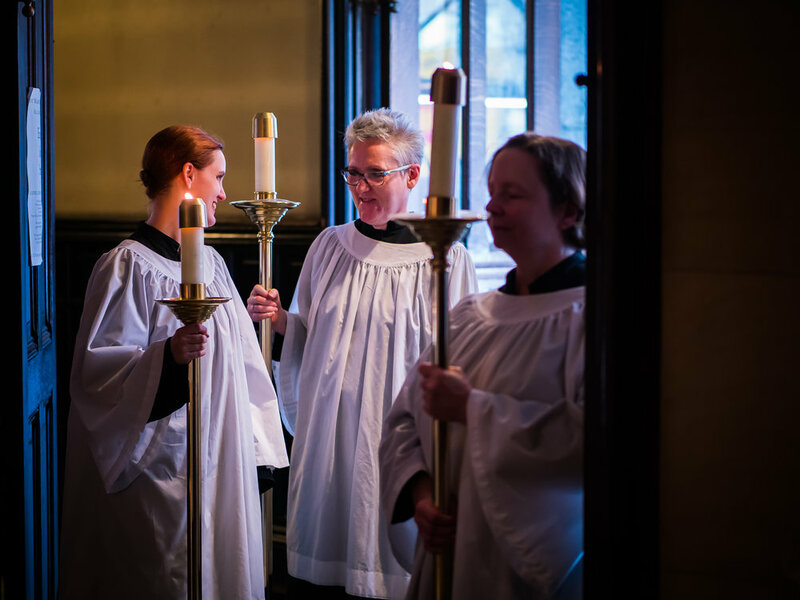 In contrast, the voices enter individually and move more independently in the Sanctus and Agnus Dei of this mass. The harmonic pallet is restrained throughout, reflecting the modal character of earlier choral music, yet Langlais' setting is clearly a work of his time and place. Behind the scenes: Grace Mudd (L), Marie Rosseels, and Marie Postelwate waiting for the procession of gifts to begin. ALTAR FLOWER DONATION OPPORTUNITIES . . . 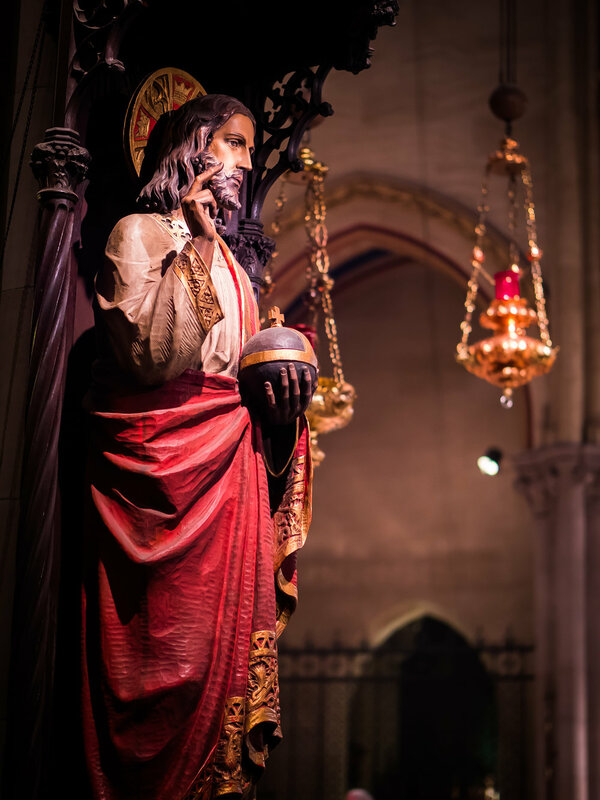 The following Sundays have not been covered by donations: August 19, September 2 and 23, October 14, 21, and 28, November 4, 11, 18, and 25, and Sunday, December 16, Gaudete Sunday. If you would like to make a donation, please contact the Parish Office. OUTREACH AT SAINT MARY'S . . . Donations and volunteers are needed for our next Drop-in Day on Wednesday, September 26, and for the many requests for assistance between Drop-in Days. We are in particular need of basic items such as the following: packs of new underwear in various sizes for both men and women; slacks for both men and women, including jeans, chinos, khakis, etc. ; packs of new socks, white and black; rainwear; knapsacks; and toiletry articles. Please contact Sister Monica Clare if you would like to volunteer for this important ministry or if you would like to make a donation . . . We continue to receive nonperishable food items for our outreach partner, Saint Clement's Food Pantry. Please place those items in the basket near the ushers' table at the Forty-sixth Street entrance to the church. LOOKING AHEAD . . . Friday, August 24, Saint Bartholomew the Apostle . . . Monday, September 3, Labor Day . . . Friday, September 7, Eve of the Nativity of the Blessed Virgin Mary . . . Friday, September 14, Holy Cross Day . . . Friday, September 21, Saint Matthew, Apostle and Evangelist . . . Friday, September 28, Eve of Saint Michael and All Angels. AT THE GALLERIES . . . "Learning to Remember" at the Museum of Jewish Heritage, Edmond J. Safra Plaza, 36 Battery Place, New York, NY 10280, until August 26, 2018. From the Museum website, "The Museum of Jewish Heritage-A Living Memorial to the Holocaust is commemorating twenty years of serving as New York's Holocaust Memorial Museum with a series of special exhibitions and installations, public programs, and community events. Learning to Remember offers a glimpse of some of the most compelling, thought-provoking, and historically significant exhibitions presented by the Museum in the last two decades. These exhibitions explored important topics-from Jewish resistance against the Nazis to the American Jewish connection to Lady Liberty-and attracted diverse audiences to what is now the third largest Holocaust museum in the world."